Rehabilitation - Tunnel Scanning - Tunnel - Projects - Home - dibit Measuring Technique USA, Inc. The Schlüchterner Tunnel is a railway tunnel and part of the Kinzigtal railway on the route Frankfurt / Main to Fulda. The tunnel, which has been in operation since 1914 basically consisted of horseshoe-shaped brickwalls which were built on sandstone. The tunnel rehabilitation measures included a permanent solid invert, which was a necessary upgrade to improve structural stability as well as a new layer of reinforced concrete as final tunnel lining. With the beginning of 2014, trains will go through a pipe instead of a horseshoe. Since summer 2011 Alpine BeMo Tunnelling has been rehabilitating the old Schlüchterner tunnel. The first step was to add a 30 cm shotcrete layer to the existing tunnel surface and reinforcing it with wire mesh. At the same time the excavation of the invert took place. 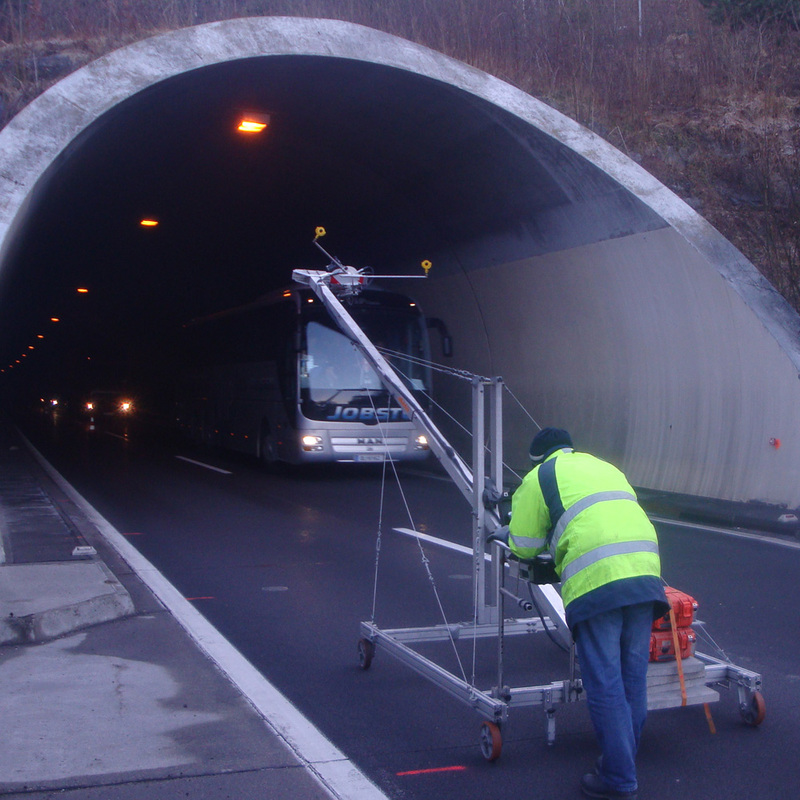 The dibit measuring system tunnel scanner LSC 4200-MR was deployed to check the new shotcrete layer of the old Schlüchterner tunnel and its cross passages. 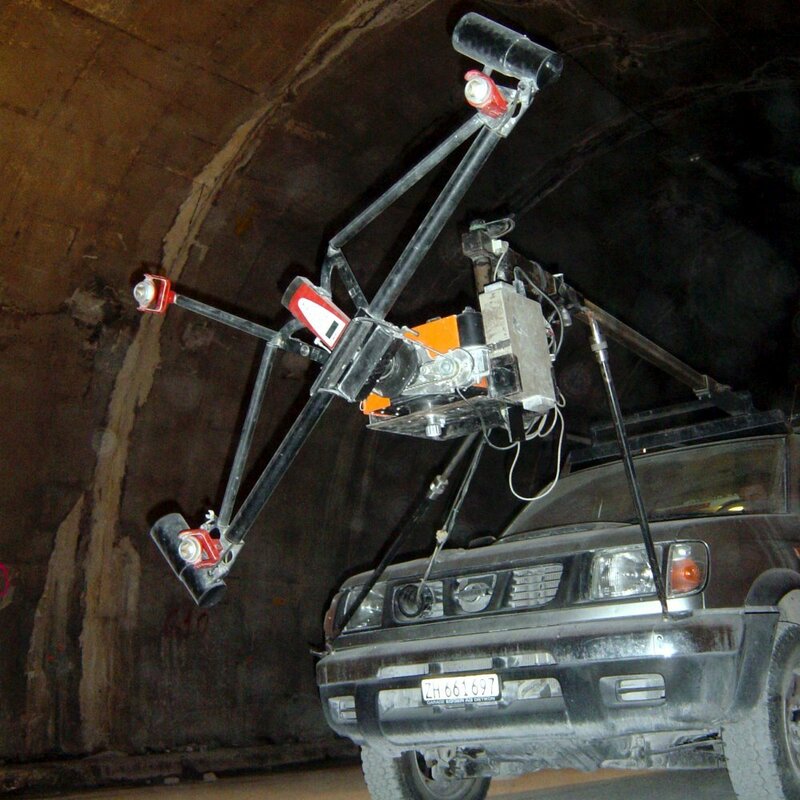 Because of the narrow shape of the tunnel and the uneven base, the tunnel scanner system was mounted on an offroad vehicle. Scanning tasks included the comprehensive geometric and visual recording and depiction of the tunnel surface, quality checks (undulations), volume calculations, etc. Geotechnical measurements, which needed to be accomplished to observe deformations and movements during the rehabilitation phase, were carried out daily with total station and convergence monitoring bolts. 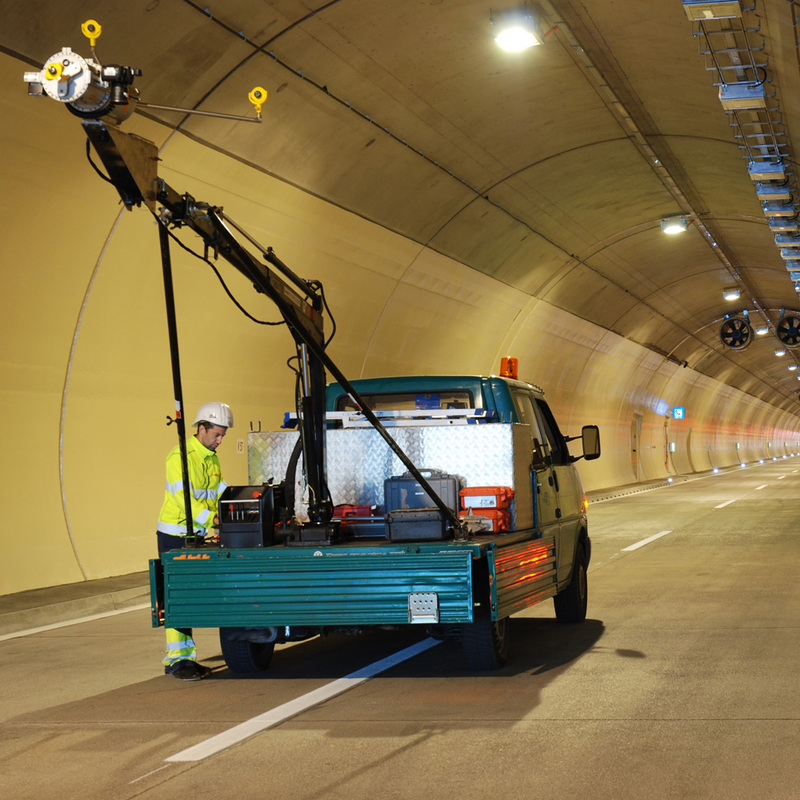 All 4 tunnels at the north bypass route in Klagenfurt are undergoing rehabilitation and are upgraded with a fire protection system. A tunnel scanner survey of the tunnel lining has been implemented to determine the actual tunnel geometry and space needed for the fire protection system which must be in accordance with the tunnels clearance envelope. This clearance envelope profile was used as a reference for clearance verifications. The task included a combined geometrical and visual in-situ assessment of the tunnel lining (incl. roadway) with a tunnel scanner. The surveying work in the tunnel has been carried out during lane shut downs. The traffic was diverted on one lane while the survey crew worked on the other. A complete shut down of the tunnel was not possible due to the heavy traffic flow in that area.. Calculation of the clearance space between actual tunnel lining and designed clearance envelope. Generating results, such as contour maps and as-built cross sections. The 35 year-old westbound bore has been affected by cracks and fractures over the years to a point where a general rehabilitation of the tunnel and roadway had to be done. The existing final lining was removed, upgraded with a waterproofing membrane and covered with a new reinforced concrete lining. The complete roadway including drainage pipes and fire protection pipes were demolished and new constructed. Additional niches for call boxes and fire extinguisher were installed. Goal of the project was to completely renovate both tunnel bores and implement a state of the art operations and safety upgrade. Geodetic surveys were conducted during the removal and reconstruction phase to monitor deformations. 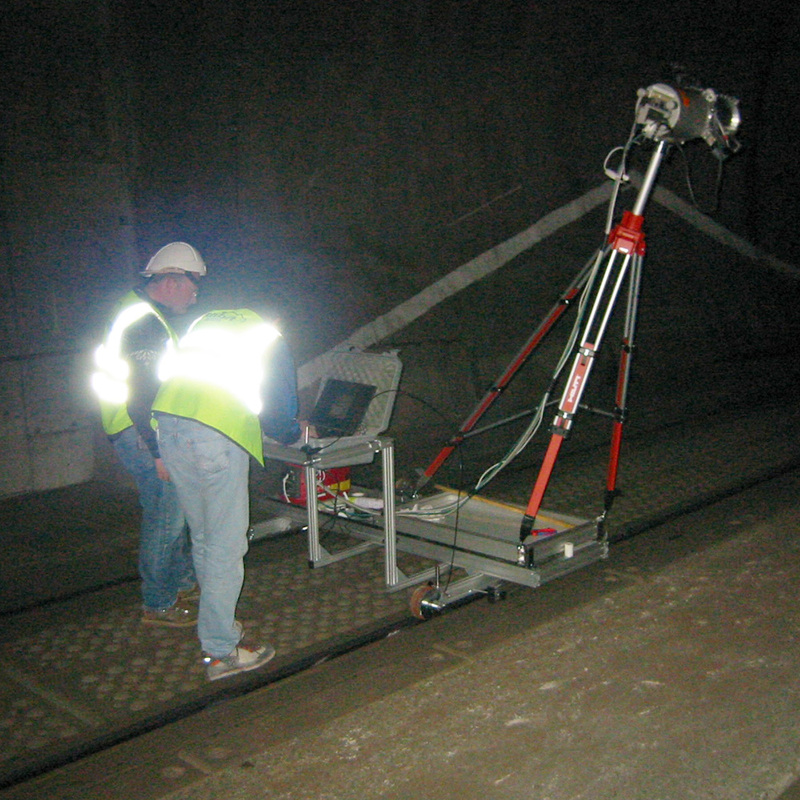 The geodetic monitoring measurements of deformations above and below ground were periodically carried out for the complete tunnel. The deformation curves were graphically plottet onto monitoring reports and submitted to the client geotechnical engineers. 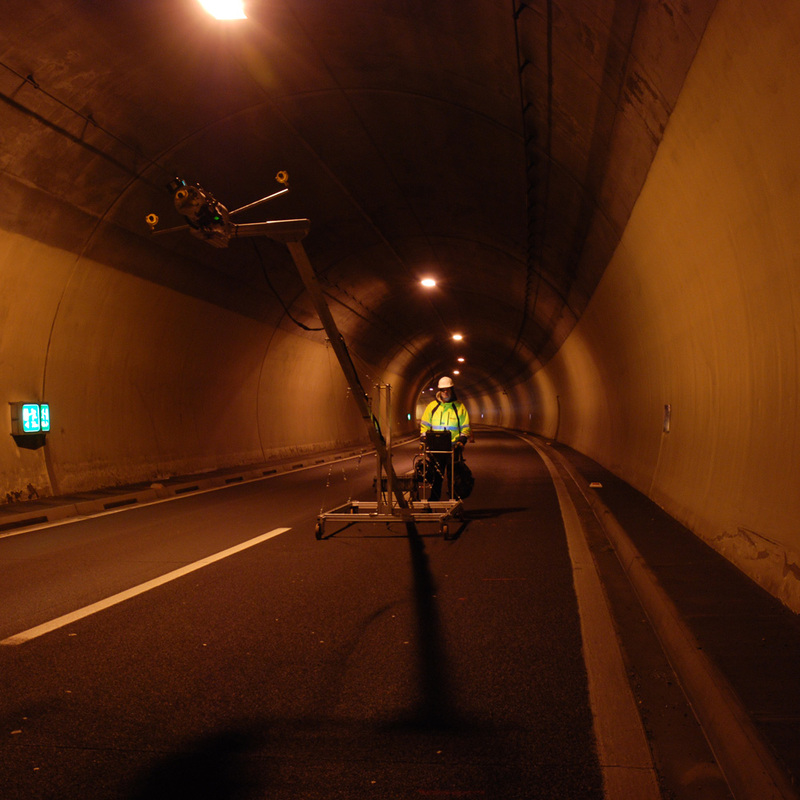 The comprehensive tunnel scanner survey of the existing tunnel surface before rehabilitation work and an as-built after, documented every step of the rehabilitation process. Excavated rock and shotcrete lining as-builts were conducted as quality and control checks. 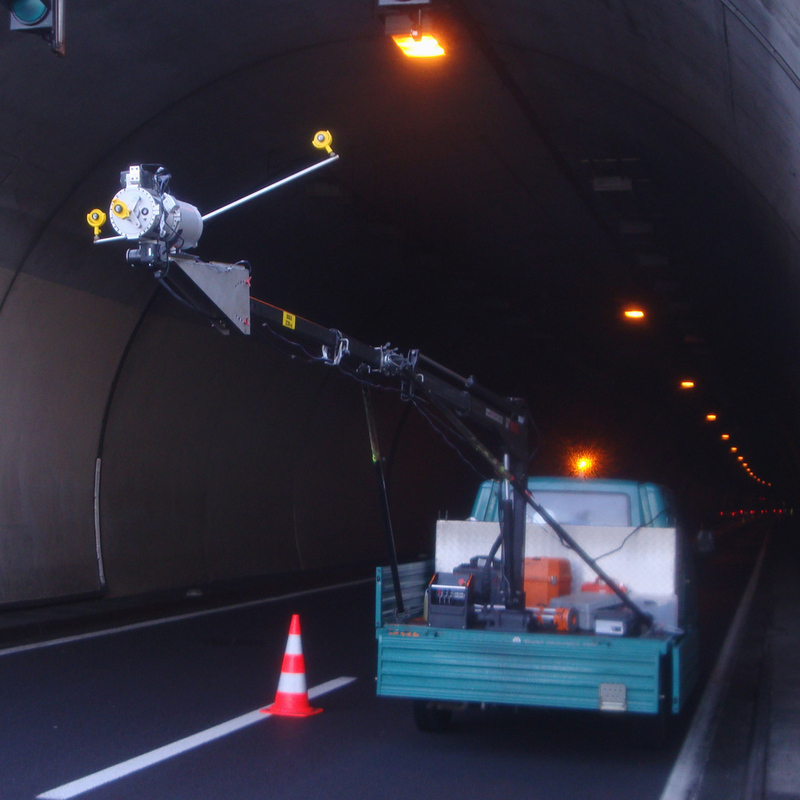 A final pass through with the tunnel scanner before traffic opened was performed as a final as-built and reference for future surveys.The results during the rehabilitation process were delivered to the client within 24 hours. Network measurements included the maintenance of the underground control point network. The underground control points were periodically verified and necessary corrections applied. Part of the construction survey for the contractor included stake outs, setup routines and control measurements for setting the final lining concrete form. 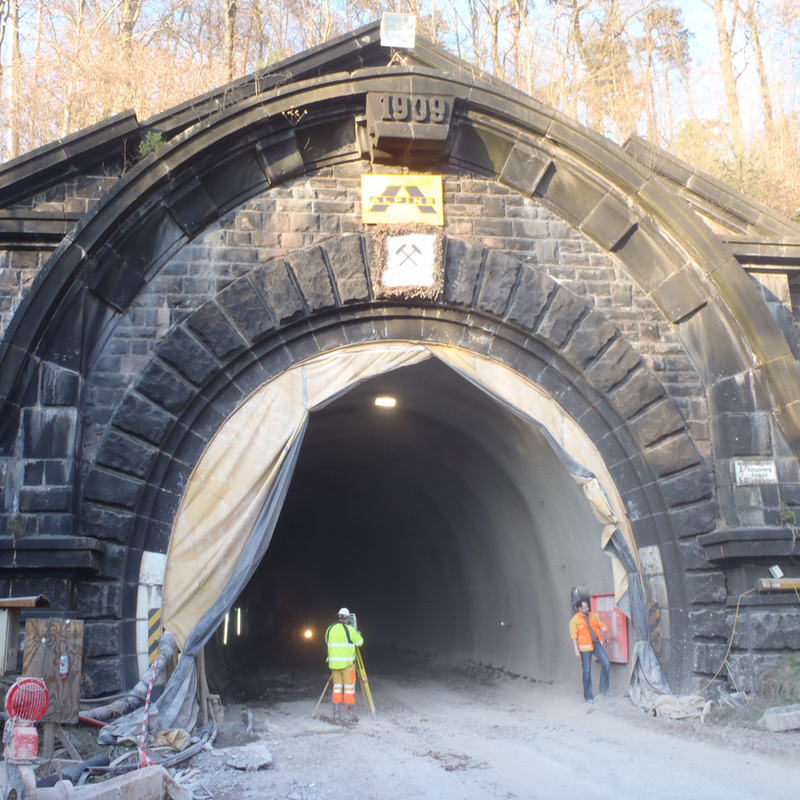 As part of the safety related upgrade of the 100 year-old Arlberg tunnel the tunnel profil was enlarged to generate a wider clearance envelope for trains going through. 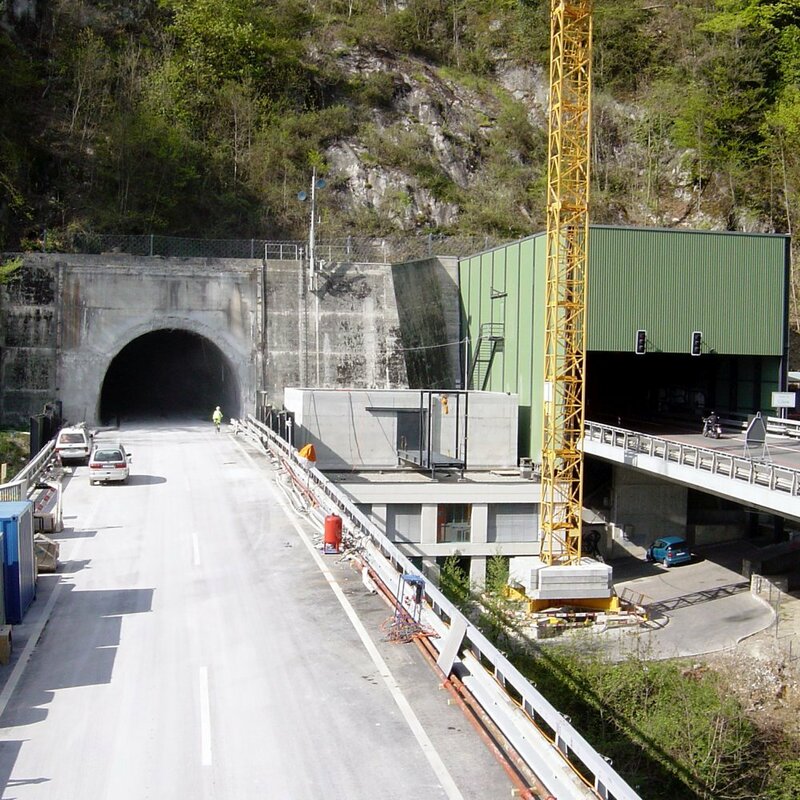 To avoid impairing the stability of the tunnel construction, removals were reduced to just the indispensable extent. It was the planner's job to make the most of the existing clearance envelope by relocating or lowering the rail axis as far as possible. As fundament for these optimizing tasks the planner received tunnel scanner recordings of the existing final lining from which he could create removal plans for the contractor. For some sections, which had been repaired with shotcrete a number of years ago and where the obsolete shotcrete was removed, an additional in-situ assement was accomplished as basis for further rehabilitation works and for calculations of material to be removed. 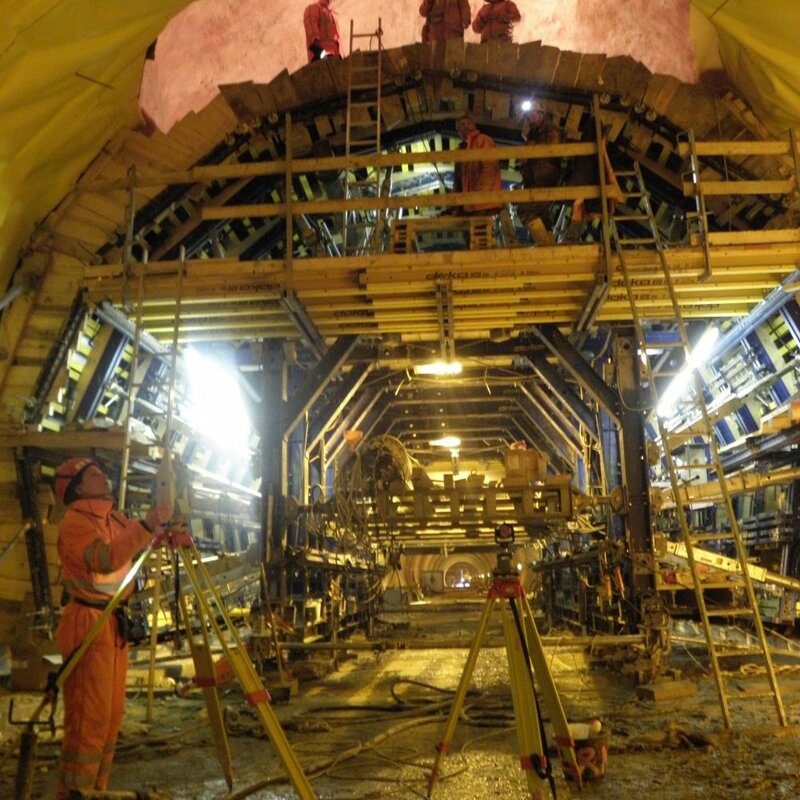 Susequent to the ablation of sub profile areas and the reconstruction of the new shotcrete lining, a final tunnel scanner recording was implemented before opening the railway tracks, to check the compliance with the clearance envelope and to record the accomplished operations. The Weehawken Tunnel was constructed in 1881. The total length of the tunnel is 1,275 m. Approximately 70 % of the tunnel was unlined with the rock exposed and unsupported. Water and ice have deteriorated the lined and unlined tunnel sections. New Jersey Transit Authority decided for a complete rehabilitation of the tunnel including the construction of a large underground station cavern in the middle of the tunnel. The FKSB JV hired DIBIT USA, Inc. to scan specific tunnel sections in order to provide a detailed documentation of the actual tunnel profile. The sections to be scanned, showed large overbreak and were supported with lattice girders and shotcrete. In these sections it was necessary to calculate the actual volume of the shotcrete lining by comparing the actual excavation line with the theoretical surface of the shotcrete lining. The results provided to the client consists of contour maps, tunnel profiles and 3D models. 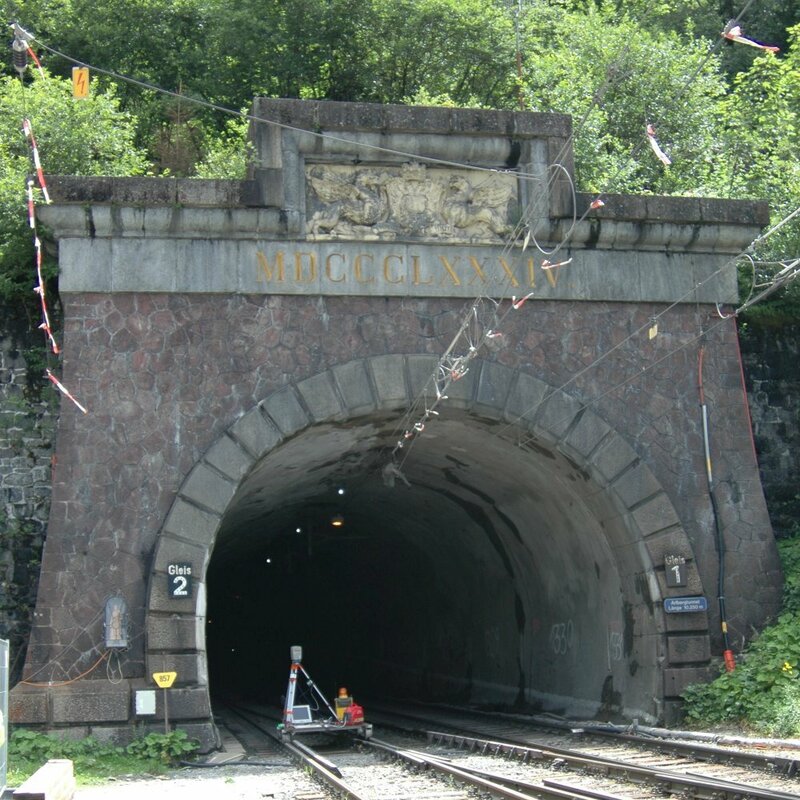 Tunnel de Glion exists of two tubes - "Lac" and "Montagne", which are both two-lane highway tunnels of the swiss 9th national road. When they were rehabilitated they were about 30 years old. Due to ageing phenomenas the concrete facing layer and the plenum ceiling had to be removed. An efficient lengthwise tunnel ventilation system was implemented, therefore the reconstruction of the facing layer and the plenum ceiling was not necessary. The total length of the tunnel was re-sealed and instead of the facing layer a new tunnel lining was rebuilt. To minimize milling works at the old tunnel lining and to optimize the geometry of the new vaults final lining a comprehensive tunnel scan was ordered. The recording was accomplished during rehabilitation works after removal of plenum ceiling and facing layer but before starting concrete works. From these data an optimized axis was calculated. Optical 3D- deformation measurements for construction monitoring were periodically accomplished during work. Construction time extended over 7 month for each tube.